There is a bumper sticker campaign in Bellingen currently. "Free Speech is not Sedition" and "Free Speech is not Terrorism". As any headline editor know We Humans, being exceptionally well adapted to pattern recognition tend to see the patterns which are dominantly programmed (via parents, teachers, media and all other manner of cultural propogation), and the cultural mind of the moment seems hell bent [pun intended] on diving into fear. As such there is a tendency in the instance of a car flashing past to see "Sedition" and "Terrorism" . Many of us are able to recognise the machinations of the controlling mind, but the reminder is needed that the reminder of such things is not! 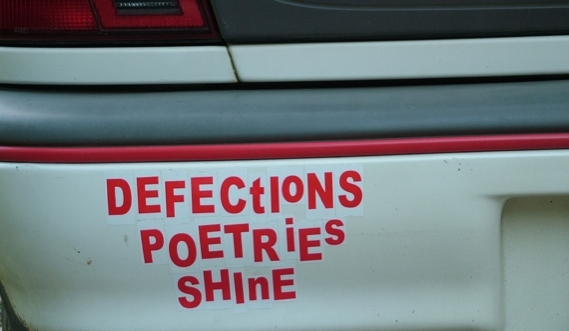 I stopped a woman in the street recently as she alighted from her sticker adorned car. Our conversation proceeded along these lines. "....uh..yeah..well it is NOW! It wasn't when I stuck it there!" It seems there has another meeting of the Bellingen chapter of "the body against sedition laws who produced these stickers", and consensus has been reached with regards to a course of action in relation to this conundrum. The word "not" is to be crossed out with permanent marker and the word "now" inserted in it's stead. I decided upon a different approach, searching for anagrams to utilise the now superseded stickers somewhat more poetically.